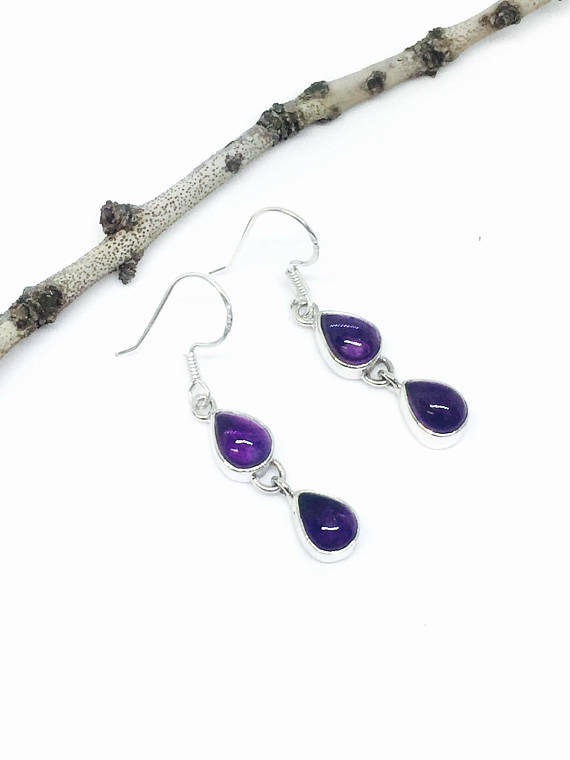 Amethyst Earrings set in Sterling silver 92.5. Genuine natural amethyst stones. Perfectly matched stones. Length - 1 inch. Ruby ring in sterling silver 925. Size -6,7. Genuine natural ruby stone. Organic style band. Amethyst earrings set sterling silver 92.5. Natural authentic amethyst stones perfectly matched . Rainbow moonstone earring set in Sterling silver 925. Length- 1/2 inch long. Perfect matched natural moonstones. Amethyst ring set in Sterling silver 925. Bezel set amethyst stone. Size -4,5,8. Natural authentic amethyst stone- 10mm round. K2 blue Azurite jasper ring in sterling silver 925. Size -8. Genuine authentic stone. Sunstone, citrine, amber, clear quartz multistone Bracelet set in sterling silver 92.5. All natural authentic stones . Adjustable length. Butterfly solid sterling silver 925 band. Size-3,4,5. Satisfaction guaranteed.